Theatre for a New Audience at Polonsky Shakespeare Center, 262 Ashland Place, Brooklyn NY. If your attention has wandered during the last third of Shakespeare's "Julius Caesar," you are not alone, but redemption is at hand. 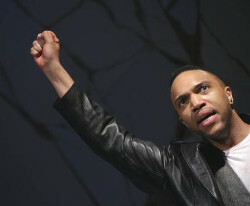 Theatre for a New Audience's portrayal of the aftermath of the assassination of Caesar, running through April 28 at Polonsky Shakespeare Center in Brooklyn, is a revelation. Following Cassius's conscription of Brutus, who rationalizes his initial doubts, and the killing and funeral orations, all played out grippingly, the ensuing violent power struggle is must-watch Theatre. "Julius Caesar" accounts what occurred in and after 44BCE, the year of Caesar's murder, two years after he had assumed virtually unlimited power as dictator. Fearing his further elevation ("…this man would be a God"), certain nobles carried out his murder in the name of the fading Roman Republic. The principal nobles, Cassius and Brutus, were later driven out and defeated by the forces of Caesar's disciple Marc Antony and the late emperor's great-nephew and adopted son Octavius Caesar. And the rest is history. Literally. While the play is ninety-five percent in verse, it is short on poetic flourishes and imagery, making a naturalistic approach, like this one, a good fit. Cassius (Matthew Amendt) is a wily salesman, whose exchanges with Brutus (Brandon J. Dirden) are alternately cajoling and heated. Jordan Barbour as Marc Antony. Photo by Gerry Goldstein. As much passes between their demeanors as in their speeches, and once Brutus is onboard ("It must be his death"), the conspiracy plays out. Familiar as it is, the run-up to the killing is suspenseful, and the act itself is wrenching. The intermission occurs after the Roman citizenry, fired up by Antony (Jordan Barbour)'s "Friends, Romans, countrymen…" oration, stomps to death the poet Cinna, unfortunately same-named as one of the conspirators. That urgent cameo, enacted by Galen Molk such that you feel Cinna's pain, is a virtual treatise on mob mentality. So realistic is the Cassius-Brutus relationship that their later argument over a bribery issue is like eavesdropping on a brothers' squabble ("Brutus, bait not me; I'll not endure it"). They do make up, but family harmony is not to be. After ferocious battles with their common enemies, both take their own lives, Cassius in the mistaken belief that Brutus had been defeated (not yet) and Brutus in regretful despair: "Caesar, now be still; I kill'd not thee with half so good a will," as he runs on his dagger. Director Shana Cooper's modernist approach suits the acting styles – and vice versa. Dirden never loses sight of Brutus's lingering doubts, even (or especially) as he is administering "the most unkindest cut of all." 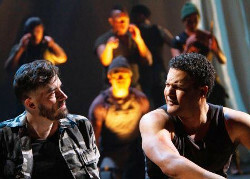 Amendt keeps Cassius's frustration with Brutus on the front burner, and Barbour grows into the role of Antony as the character does in the play. L-R: Merritt Janson and Brandon J. Dirden. Photo by Gerry Goldstein. Merritt Janson and Tiffany Rachelle Stewart bring more substance to Portia and Calpurnia, respectively, than I've seen in other productions. Both leave no doubt of their devotion and the despair that foreshadows husbands Brutus and Caesar's fate. The precisely choreographed (by Erika Chong Shuch) battle scenes are prolonged beyond necessity, but the schematics work. One squad of a dozen or so plays both armies, with opposing sides alternately facing downstage or up. This play's many well-known phrases are integrated without pointing them up, which is more praiseworthy than it should be. Casca, for example, makes the "…Greek to me" sequence funny. And in a less-is-more moment, the Soothsayer barely whispers (mouths, really) "Beware the ides of March" into Caesar's ear. It is the only Shakespearean "read my lips" I can recall. While its theme of incipient tyranny imbues the play with relevance to our time, it is ultimately a ‘Be careful what you wish for' scenario. Impeachment in 44BCE (by dagger, but still) resulted in chaos. A lesson to learn?